It’s been just over two months since President Trump met North Korea’s Kim Jong Un in Singapore, and there has been little visible progress so far in persuading North Korea to give up its nuclear weapons. On Wednesday, North Korean state media seemed to offer an explanation: First, the Korean War must officially end. The remarks were a reminder that the future of the two Koreas is still tightly tied to their past — in particular, to a war in which the bulk of the fighting stopped 65 years ago. [post_ads]Though the war lasted from 1950 until an armistice in 1953, the last two of those years were pretty much a deadlock. The end result was, in many ways, inconclusive. The first months of the war saw the North invade the South and storm nearly all the way down the peninsula; then a counterattack by United Nations troops that brought them to the North’s border with China; and finally, an invasion by China that pushed U.N. forces back to the area around the 38th parallel, where the front lines would remain. Even if little territory was exchanged, the rest of the war was devastating. North Korea was subjected to a huge bombing campaign, and estimates suggest that 2.5 million civilians died during the conflict. For years, there was talk of an armistice agreement to end the fighting, but a number of issues, including the repatriation of prisoners of war, kept that from happening. The election of President Dwight D. Eisenhower in 1952 and the death of Soviet leader Joseph Stalin helped spur negotiations, and North Korean and Chinese forces and the U.N. Command finally signed an armistice on July 27, 1953. 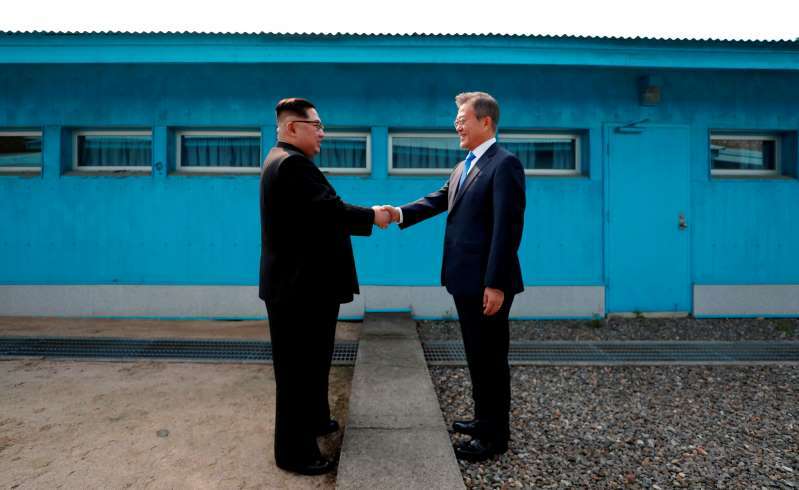 The agreement halted fighting and established the demilitarized zone (DMZ). South Korea was not a party to the armistice; indeed, South Korean President Syngman Rhee had wanted to keep fighting. In theory, the armistice was meant to be temporary, calling for a "complete cessation of hostilities and of all acts of armed force in Korea until a final peaceful settlement is achieved.” But a peace conference held in Geneva in 1954 failed to find a full peace deal, in large part because both sides considered themselves the victors. Escalating tensions in what was then French Indochina also complicated matters. The United States subsequently abrogated one part of the armistice by moving nuclear weapons into South Korea in 1958. Though full-fledged fighting never resumed, military tensions remained high. There have been a number of violent incidents, including in 1976 when North Korean soldiers hacked two U.S. Army officers to death in the DMZ after they tried to trim a tree. Since the 1990s, North Korea has frequently said it would no longer abide by the armistice. For North Korea, the appeal of the end of the Korean War is obvious: It would help legitimize the North Korean regime — perhaps even leading to diplomatic recognition from the United States — and add another small barrier to renewed conflict on the peninsula. Some experts have suggested that the process could start with a U.S.-North Korea declaration that the Korean War has ended ― a move that would carry big symbolic weight but require fewer legal hurdles than turning the armistice agreement into a full peace treaty. That would potentially require coordination with Beijing as well as the approval of Congress. South Korea sees a declaration as a way to improve inter-Korean relations and pave the way for a peace treaty. But because Seoul is not a party to the armistice, its views carry less legal weight. And though Beijing has signaled its willingness for a peace treaty or declaration, the messages from Washington have been mixed. What role does the United States play? But while the agreement signed in Singapore by Trump and Kim contained a reference to building a “lasting and stable peace regime on the Korean Peninsula," the United States apparently sees this as something that would happen only after North Korea agrees to give up its nuclear weapons. The U.S. government is wary of rushing into a declaration of the end of the Korean War for much the same reason that North Korea wants it. Even though such a declaration may not carry significant legal weight, it would serve as a symbolic recognition of North Korea as a nuclear state and strengthen calls to downsize the U.S. military presence in South Korea. Any declaration could also be seen domestically as a capitulation by Trump, marring what has been portrayed by the administration as a clear victory for his “maximum pressure” approach. If the declaration were too weak, North Korea could reject it out of worries that it could be overturned by a subsequent government; were it too strong, the United States would have given up one of its strongest cards too early in negotiations. But with progress slow on the denuclearization front, the United States may be forced to consider methods of speeding it up. And with a month of North Korean diplomacy coming up in September, that decision may come sooner rather than later.